Click here to access our portfolio, trade alerts and newsletter! 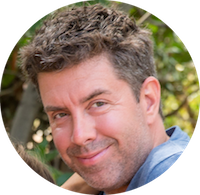 Jason Hamlin2019-04-10T14:50:47-07:00April 10th, 2019|Comments Off on Is Litecoin Just a Testnet for Bitcoin or a Vastly Undervalued Cryptocurrency? Jason Hamlin2019-03-26T13:14:47-07:00February 11th, 2019|Comments Off on Central Bank Gold Demand Spikes to Highest Level in Nearly 50 Years! Ready to Start Profiting with The Contrarian Report? Gold bottomed around $1,050 in December of 2015 and has been trending higher ever since. The gold price has established a new bullish trend channel, with higher lows every year over the past three years. The price needs to break above resistance at $1,360 to confirm that the next bull cycle is underway. 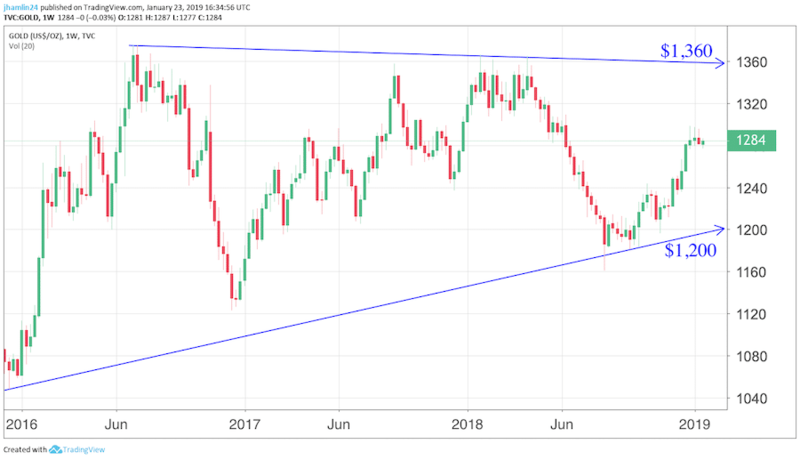 Once this occurs, our analysis suggests that the gold price will quickly climb back to all-time highs around $2,000 per ounce and then push to $3,000 per ounce by the end of 2020. If you think our price targets are bullish, consider that John Williams of Shadowstats.com forecasts that gold needs to climb to nearly $9,000 and silver to over $500 per ounce to match the inflation-adjusted highs attained during 1980. All of the fundamental conditions that generated gold’s 1980 high are much more severe today. Fiat currencies are rapidly declining in value versus real assets, as the Federal Reserve, ECB and Western governments are printing and borrowing with reckless abandon. This race to debase and skyrocketing debt levels are creating ripe conditions for inflation and the potential for hyper-inflation in the coming years. Adding fuel to the fire, Russia, China and other countries around the world are starting to bypass the dollar in international trade. Indeed, it appears the days of the dollar as world reserve currency are numbered! Profit from 3.5x Leverage in Undervalued Mining Stocks! Gold and silver will be excellent investments in the year ahead and we advocate holding some physical metals in your possession. But the biggest profit opportunity is with mining stocks. The Gold Miners ETF typically offers leverage of 3x to 4x the advance in the gold/silver price. We expect our top mining stock picks to generate leveraged returns of 5x to 10x the price advance of gold during the next few years. In other words, if the price of gold double from $1,300 to $2,600, we expect the mining stocks held in the GSB portfolio to go up 500% to 1,000% in the same time period! Mining stocks are currently very undervalued relative to gold. The following chart shows the ratio of the gold stocks index (HUI) to gold and gives us an indication of how undervalued mining stocks are relative to the metal they mine. The horizontal blue line at 0.35 and represents the long-term average for this ratio. The ratio is currently around 0.12 and would need to go up 3 times to return to this long-term average. 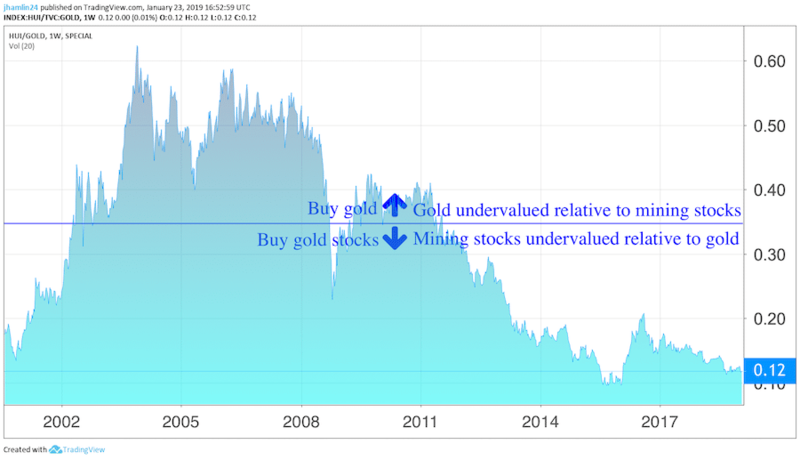 As long as it remains below the line at 0.35, mining stocks are undervalued relative to gold and a clear buy. With the ration at just 0.12, mining stocks are very undervalued relative to gold and represent a very strong buy! At Gold Stock Bull, we specialize in picking mining stocks that outperform the market by a wide margin. The GSB portfolio has been a consistent top performer and you can gain instant access by signing up today. We started recommending bitcoin to subscribers when it was around $100 and Ethereum under $10! We were one of the first investment newsletters to cover cryptocurrencies, reporting on Bitcoin, Ethereum, Litecoin, Dash and others. Our research includes bitcoin technical price analysis, bitcoin price forecasts, bitcoin news updates each month and recommendations for when to buy and sell bitcoin and other cryptocurrencies. We cover speculative small-cap cryptocurrencies that are up-and coming, with a strong track record of picking winners before the market takes notice. We believe that gold and bitcoin are complementary assets that should be owned together. We believe that all investors should consider a small allocation to cryptocurrencies for diversification purposes and to take advantage of their rapidly rising value. Cryptocurrencies are also easy to store securely, can be used to transfer money around the world instantly, privately and at little cost. Adoption is increasing and we believe that an inflow of institutional capital will propel prices much higher over the next few years. When you subscribe to our newsletter, you will get our “Guide to Investing in Bitcoin and Other Cryptocurrencies,” which covers everything you need to know to get started. This includes a section on why you should invest in cryptocurrencies, where to purchase them at the best prices and how to store them securely. We also cover how to identify and purchase altcoins that have the potential to outperform bitcoin and generate home-run returns over the next few years. This guide is a living/breathing document that will be updated periodically as new information becomes available. 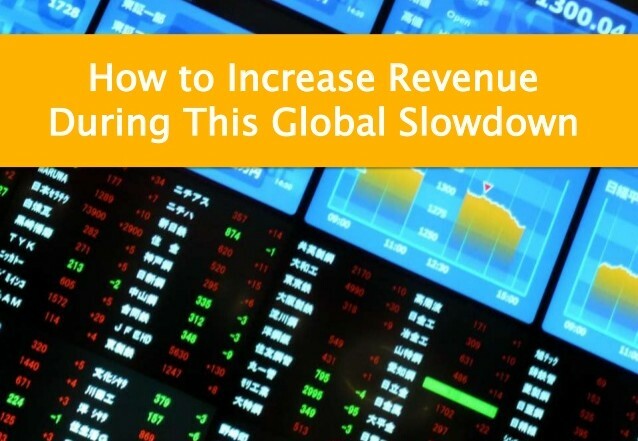 This is a key feature, as the cryptocurrency landscape is evolving very rapidly and we want our subscribers to stay on top of the latest information and trends. In addition to the guide, subscribers are given Jason’s personal email address and can email him directly with questions. We usually reply to all questions within 24 hours and have a sincere desire to see every one of our subscribers increase their wealth and meet their investment objectives. Jason is the founder of goldstockbull.com. He previously worked in data analytics for the world’s largest research firm, consulting to Fortune 500 companies. Jason eventually leveraged those skills to trade successfully full-time. 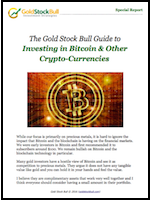 After helping friends and family optimize their investments, he launched Gold Stock Bull and The Contrarian Report newsletter. Jason’s investment philosophy takes into account political, historical and socio-economic factors to determine macroeconomic trends and isolate the sectors that stand to benefit most. He then applies fundamental and technical analysis, as well as proprietary models, to find the companies within these sectors that will outperform their peers. Jason is a cycles investor with a contrarian eye for identifying undervalued assets. Jason’s work appears on Kitco, Seeking Alpha, Yahoo News, 321gold.com, Mining.com, Gold-Eagle.com and other publications. Jason is a regular keynote speaker at investment conferences throughout North America and has built an expertise in both the precious metals and cryptocurrency markets. He believes in honest money, limited government, decentralization of power and enjoys studying alternative economic models. 1) High inflation and devaluation of the U.S. dollar are inevitable. 2) Political instability and growing distrust of fiat currency will favor gold and cryptocurrencies. 3) The stock market rally is artificially-induced and is therefore unsustainable. 4) Gold, silver and cryptocurrencies will have an increasing role in global finance. 5) Precious metals are significantly undervalued and the gold bull market is far from over. 6) It is wise to limited counter-party risk by holding physical bullion and private keys in your possession. 7) Mining stocks are undervalued vs. the metals they mine and will offer leveraged gains ahead. 8) The boom in bitcoin, cryptocurrencies and blockchain tech is still in the early innings. Lastly, I believe in the companies that I write about and never accept payment to pump a particular stock, eliminating any conflict of interest. We are a small operation with a personal touch and know most of our subscribers by name. Much of my research is published for free on this site, so make sure to subscribe to our FREE email alerts below. When we spot investment opportunities or there is breaking news, you will get a special alert direct to your inbox. 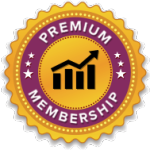 The Gold Stock Bull Premium Membership is designed to help you maximize returns in the commodity, cannabis and cryptocurrency markets. We focus on discovering up-and-coming companies before the wider market takes notice. Your take on our economic situation resonates so true. Joining the premium service has made a huge difference to my portfolio over the past 6 months and I couldn’t be happier. Thank you, thank you, thank you! Analyzing and predicting market movements is a passion of mine and I have a sincere desire to help as many people as possible reach their financial goals. I am committed to making this service as valuable and profitable to you as possible and look forward to welcoming you to the service. Click the button below to get started now!